The breakthrough was a steam engine mounted on a wagon that powered a water pump. 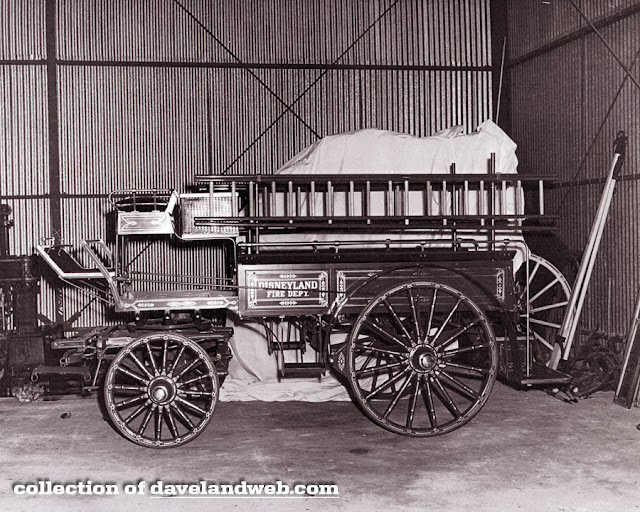 A lighter wagon with a tank of bicarbonate of soda preceded the steam pumper wagon to the fire. This so-called chemical wagon also carried sulfuric acid. Mixed with the soda, the acid produced a stream out of a small hose. For some fires, a longer hose was needed to put the stream directly on the flames. The Hose and Chemical wagon was born. The Seattle Fire Dept. lists at least thirty-five horse-drawn wagons in use between the city-wide fire in 1889 and 1924. Walt might have bought a vintage fire wagon and simply put it on display. For some reason, he decided that it should be an attraction, like the horse-drawn streetcars. In my imagination, he was thinking of letting kids borrow a helmet, jump aboard and race to fight a fire with the station's dalmatian running alongside the wagon. It didn't work out that way. The fire bell was mounted high so that children couldn't reach it, and the fire house was closed whenever Uncle Walt was using his upstairs apartment because he couldn't abide the racket. 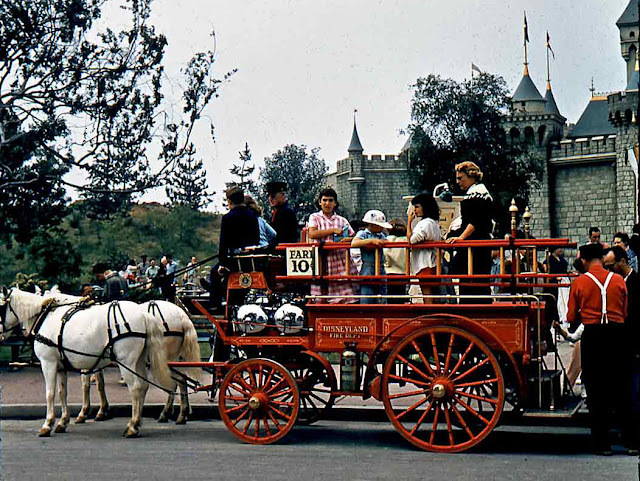 Studio carpenter Ray Fox built the Disneyland Fire Dept. 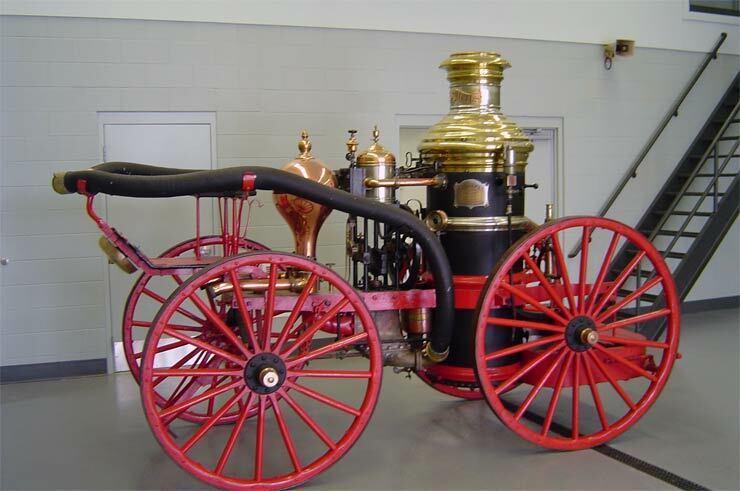 's one and only Hose & Chemical wagon and horse and wagon man Owen Pope collaborated. The design is clever, replacing the large soda-acid tanks with two rows of benches, and using ladders as railings. Chromed sulfuric acid tanks were placed under the driver's bench. No running boards, and no racing to fires—the two-horse gig was kept at the same clip-clop rate as other horses on Main Street. 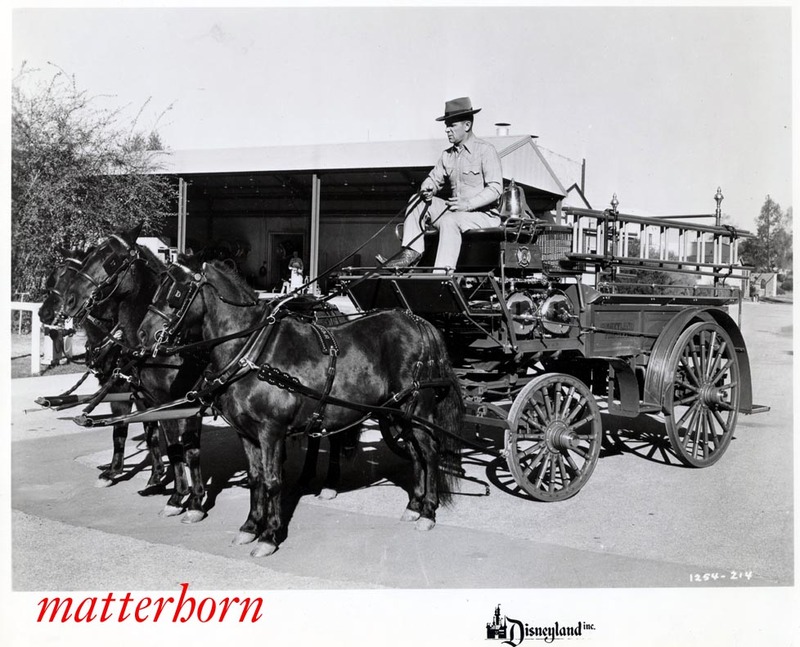 A motorized fire truck joined the low-capacity horse-drawn version in August 1958, and the original wagon was put on permanent display in August 1960. Gradually, it was seen less and less. The wagon was renovated and displayed again in July 1984, but these days the fire house is empty. 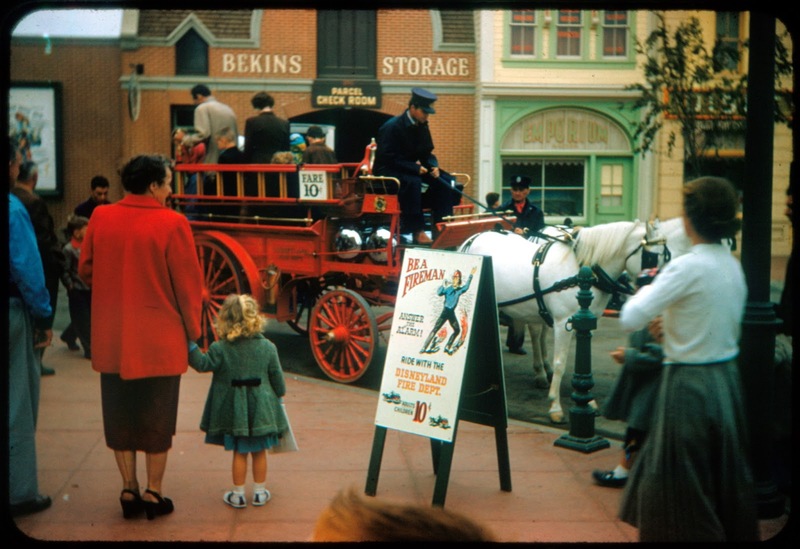 "The pride and joy of the Disneyland Fire Dept will be a horse-drawn hose and chemical wagon. Men of all ages will enjoy jumping on and 'riding to a fire. '"—Anaheim Bulletin, July 15, 1955.